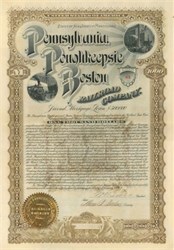 Beautifully engraved certificate from the Pennsylvania, Poughkeepsie and Boston Railroad Company issued in 1896. This historic document was printed by the New York Banknote Company and has an ornate border around it with a vignette of a train and a factory. This item is hand signed by the Company’s President ( W. W. Gibbs - William Warren Gibbs ) and Secretary and is over 106 years old. The Pennsylvania, Poughkeepsie and Boston (which later acquired the Pennsylvania, Slatington & New England) later became the Lehigh and New England. The Pennsylvania, Poughkeepsie and Boston was formed by a merger of some small railroads plus some additional construction, to connect with the Lehigh and Hudson River Railroad.